The culmination of the Coast Survey's work around Key Biscayne and Miami, Florida. Coast Chart No. 166 Florida Reefs from Key Biscayne to Carysfort Reef. A scarce and exceptionally fine coastal survey chart or maritime map of Key Biscayne Bay and Miami. The coast survey began its work on this region in the late 1850s, with this chart slowly taking shape following the Civil War, then throughout the late 1860s and 1870s. 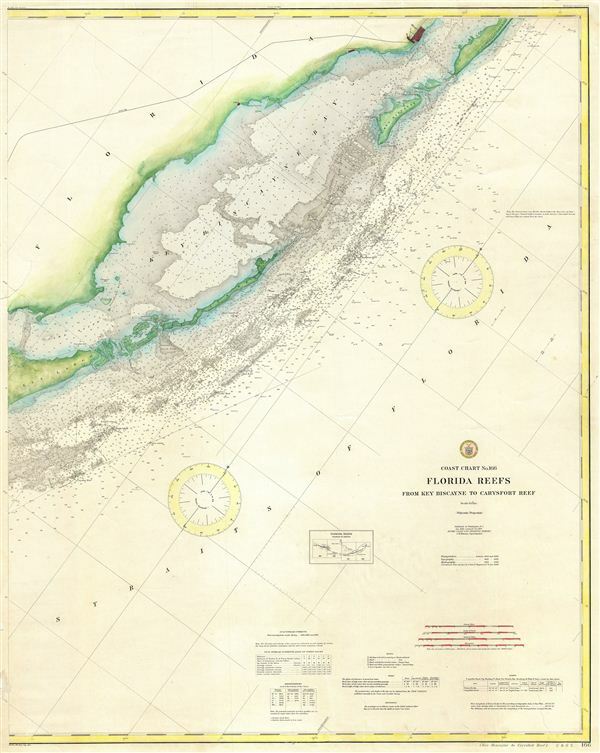 This chart acquired on its present form, with a full survey of Key Biscayne Bay from Key Largo to Miami and a detailed analysis of the surrounding waters, in 1898. The present example, published under Coast and Geodetic Survey superintendent O. H. Tittmann, has been updated to 1909. The chart was finally registered with the Coast Survey as chart no. 166. Very good. A couple of minor closed verso repairs to edges. Else clean. Center discoloration apparent in image is not present on map.